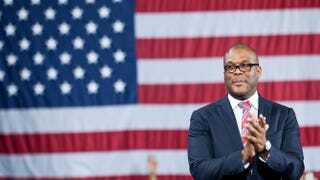 Actor and director Tyler Perry introduces President Barack Obama during a campaign event at Tyler Perry Studios March 16, 2012, in Atlanta. Tyler Perry just won the rights to use the popular phrase "What Would Jesus Do," the Hollywood Reporter reports. The actor, director and screenwriter insisted that he wasn't looking for exclusive ownership of or rights to the word "Jesus" beyond that '90s quip, the entertainment site notes. The phrase was caught up in a trademark battle between Perry and Kimberly "Poprah" Kearney, from VH1's reality series I Want to Work for Diddy. The contest began back in May 2008, when Perry registered the mark with the U.S. Patent and Trademark Office for use in the category of "entertainment services." However, before that, Kearney had already filed for a similar mark for use in a reality TV show. Representatives for Perry argued that Kearney did not really use the mark, demanding that her registration be dubbed abandoned, since it was interfering with Perry's plans for the phrase, according to the Hollywood Reporter. "Because [Kearney] did not timely answer [Perry]'s Requests for Admission the facts included are deemed admitted and are 'conclusively established,'" administrative judges wrote in an opinion canceling Kearney's trademark, according to the news site. "Despite Respondent's denials in her answer to [Perry's] petition, the deemed admissions supersede those denials and we are bound by them." So all that's left to see now is what the triple threat plans to do with the phrase.